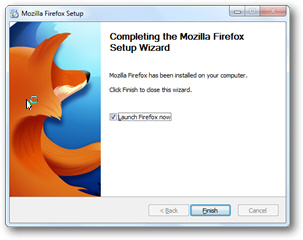 The previous tutorial explained how to download Firefox for Windows 7 / Vista / XP; in this tutorial, you will learn how to install Mozilla's Firefox web browser on your computer. If you have not yet downloaded your free copy of Firefox, go do it first, and come back to this tutorial to go through the installation process for Windows. This tutorial will show you how to use the custom installation settings, which give you more control than the default install. Except where otherwise noted, the installation process is identical whether you are running Windows XP, Windows Vista, or Windows 7. 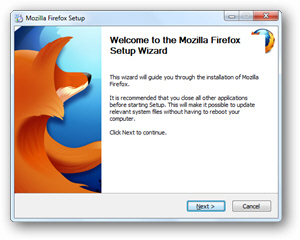 Windows 7 / Vista / XP will launch the Firefox installer, which will guide you through the steps of installing and customizing Firefox for your computer; several of these options can also be configured at a later time, once Firefox has been successfully installed. Click on the "Next" button, and the following screen will let you choose your Firefox installation type: to use all the defaults, leave "Standard" checked, and click on Next. To customize how installed on your PC, choose the "Custom" option instead, and click Next. We will choose to configure our installation settings. The next screen lets you change the folder in which Firefox will be installed: we recommend that you keep the default directory, which is "C:\Program Files\Mozilla Firefox\" (32-bit edition of Windows), or "C:\Program Files (x86)\Mozilla Firefox\" for any 64-bit version of Windows 7 / Vista / XP. Click "Next". All three are checked by default: "On my Desktop" will place the Firefox icon on your desktop, so you can double-click it to launch the application. "In my Start menu Programs folder", if left checked, will add shortcuts to Mozilla Firefox inside the Windows start menu: this is especially useful on Windows Vista and Windows 7, where you'll be able to simply start typing "Firefox" inside the start menu's search field and hit Enter to open the web browser. Finally, "In my Quick Launch bar" only applies to Windows XP and Windows 7 (learn how to enable Quick Launch in Windows 7). Click "Next" to proceed, and optionally choose another name for the "Mozilla Firefox" start menu folder (we recommend that you keep this easy-to-remember name). If, before clicking on the Finish button to close the installer and return to Windows, the "Launch Firefox now" checkbox is checked, the browser will open when the installer closes. And this is all it takes to install Firefox on a Windows PC! If you are using Windows Vista, uncheck that checkbox: otherwise, unless you are the computer administrator and the only Windows user on this computer, Firefox will run under administrative privileges, which (aside from security concerns) means that your settings will not be visible next time you run Firefox the "normal" way, under your own user profile.